Early on Tuesday, we reported on the latest statistics from Flurry which showed an amazing 353% increase in iOS and Android activations on Christmas Day. Looking at the estimated figures from Flurry, it appeared that 6.8 million iOS and Android devices were flipped on during December 25th. Unfortunately, Flurry did not break down the figures by platform. 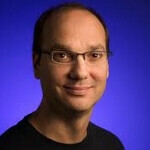 Late Tuesday, a tweet from the "Father of Android" Andy Rubin, said that Android activations for the two days ended December 25 amounted to 3.7 million units. Because that figure covers two days and Flurry's numbers covered just Xmas, we really can't figure out how many devices each platform sold on each day. 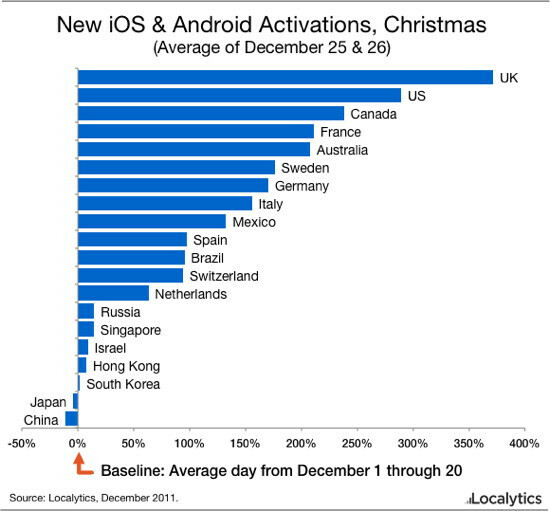 Another source of holiday activation information comes from a chart published by Localytics. Using the first twenty days of the month as a baseline, the chart breaks down the average number of iOS and Android activations for December 25th and December 26th, by country. The UK had the largest increase in activations of the two platforms on those two days with nearly 400% more iOS and Android devices turned on. The U.S. and Canada were next while France and Australia rounded out the top five. For one reason or another, both China and Japan showed lower activations of iOS and Android devices during those two days when compared to the first twenty days of the month. Perhaps a case of the "Bah, Humbug" Flu circulated in the region. My guess with China and Japan is that I'm pretty sure that the majority of the people in those countries don't celebrate Christmas. I'm fairly sure if you throw up India on there, they'd be down or around even too. My guess is that the fact that China and Japan being down is less significant than South Korea being slightly up. "My guess with China and Japan is that I'm pretty sure" Huh? I guess I'm pretty sure you've never been to Japan. Japan definitely celebrates Christmas. It's just a little bit different in that it's less focus on the gifts and tends to be simplistic. If anything it's the very reason why activations have dropped during those days, since people will be busy celebrating and gift-giving is usually small trinkets or cash, and definitely not cellphones.